I am happy to take part in the International Marian Youth Vigil in preparation for the next Assembly of the Synod of Bishops organized at the new shrine of St. Gabriel of our Lady of Sorrows. It is true that I am physically far from you, but thanks to modern communication technologies, we have the possibility to cancel distances. In fact, we Christians have always known that the one faith and prayer in harmony, can unite believers all over the world: we could say that, without knowing it, we have been the forerunners of the digital revolution! I greet your pastor, Bishop Lorenzo Leuzzi, who from the beginning of his ministry among you, has involved you in the synodal journey, and Cardinal Lorenzo Baldisseri, the Secretary General of the Synod, who is celebrating Holy Mass for you. I would now like to entrust to you some thoughts that are particularly close to my heart. The first thought is for Mary. It is beautiful that young people pray the rosary, thus showing their affection for the Virgin. Her message is more current today than ever. And this is because she is a young woman among the young, a “woman of our day,” as Don Tonino Bello liked to say. She was young – perhaps just a teenager – when the angel spoke to her, upsetting her small plan, in order to make her part of God’s great project in Jesus Christ. 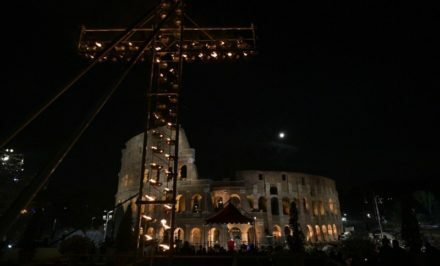 She remained young even afterwards when, despite the passing of the years, she became her own Son’s disciple with the enthusiasm of the young, and followed him to the Cross with the courage that only the young possess. She remains forever young, even now that we contemplate her Assumed into Heaven because holiness keeps us eternally young: the true “elixir of youth” that we need so badly. 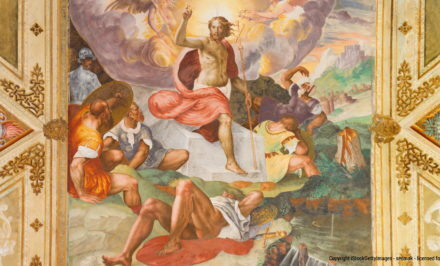 It is renewed youth that brought us the Resurrection of our Lord. St. Gabriel of our Lady of Sorrows, patron saint of students, understood this well: he was a young saint in love with Mary. He, who lost his own mother as a child, knew he had two mothers watching over him in Heaven. And so we understand his great love for the prayer of the rosary and his tender devotion to the Virgin. He wanted to associate her forever with his name when, at only 18 years old, he consecrated himself to God in the religious family of the Passionists, becoming Gabrial Addorolata. If St. Ambrose was said to be convinced that “every age is ripe for holiness,” undoubtedly this is applicable to youth. So do not be afraid to be saints: Looking to Mary, to St. Gabriel and all the saints who have preceded you, and show you the way! The first thought is for Mary. The second thought is for the young people connected to you from different parts of the world participating in this vigil. I greet with affection, the young people of Panama, gathered at the International Shrine of the Heart of Mary with Bishop Domingo Ulloa Mendieta, who I will meet next year on the occasion of the World Youth Day; the young people of the Russian Federation, gathered in the Transfiguration Cathedral in Novosibirsk with Bishop Joseph Werth and the Youth Delegate of all Russia, Msgr. 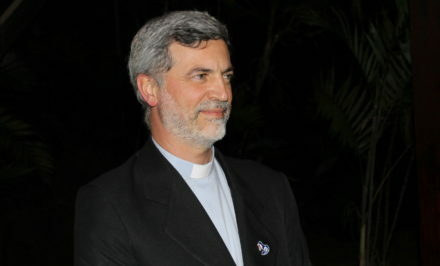 Clemens Pickel; the young people from Ireland joining us from Glencomeragh House, the house of prayer and formation for the young, together with Bishop Alphonsus Cullinan, and finally the young people of Taiwan, gathered in the church dedicated to Our Lady of the Assumption. In these days, the Bishops of Taiwan are in Rome for their ad limina visit. They will be happy to know that their young people are praying and that today, they too are together with the Successor of Peter! Dear young people, united in prayer from such distant places, you are a prophecy of peace and reconciliation for the whole of humanity. I will never tire of repeating it: do not raise walls, build bridges! Do not build walls, build bridges. Join the shores of the oceans that separate you with the enthusiasm, determination and love of which you are capable. Teach the adults, whose hearts have often hardened, to choose the path of dialogue and concord, to give their children and their grandchildren a world more beautiful and worth of humanity. The third and last thought is for the upcoming Synod. 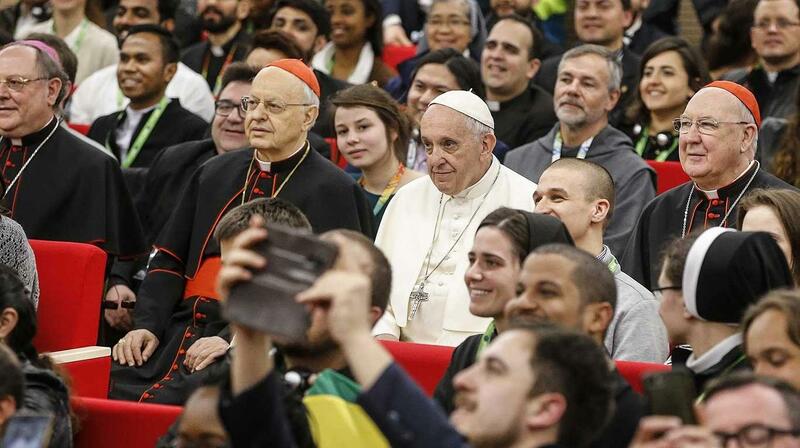 You already know that the next Assembly of the Synod of Bishops will be dedicated to “Youth, faith and vocational discernment,” and that the whole Church has been intensely engaged in the Synod journey for a long time. 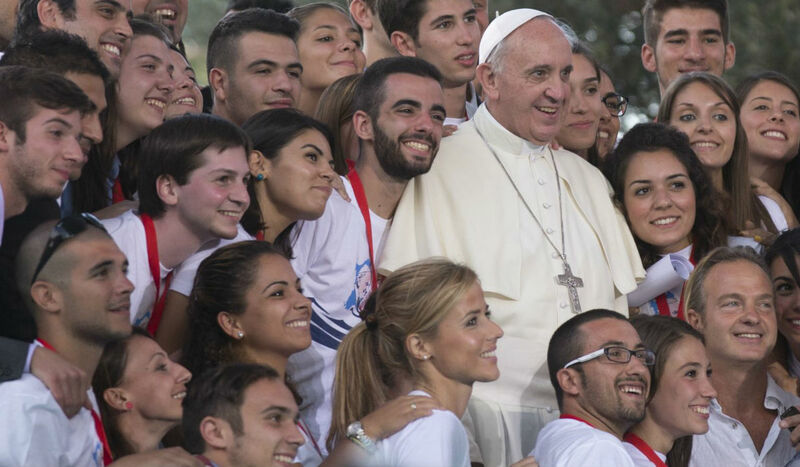 Meeting many young people like you on the occasion of the Pre-Synodal meeting last March, I warned of the danger of talking to young people without letting young people speak, keeping them at a “safe distance.” Young people do not bite, they are approachable and enthusiastic. And you, besides your enthusiasm, have the key to the future. Dear young people, returning to your families and your parishes – in Teramo, Panama, Russia, Ireland, Taiwan – do not let yourselves be silenced. Of course, those who speak can make mistakes, and even young people sometimes make mistakes: they are human, and can be imprudent, for example. But do not be afraid to make mistakes, and to learn from your mistakes: that is how we go forward. 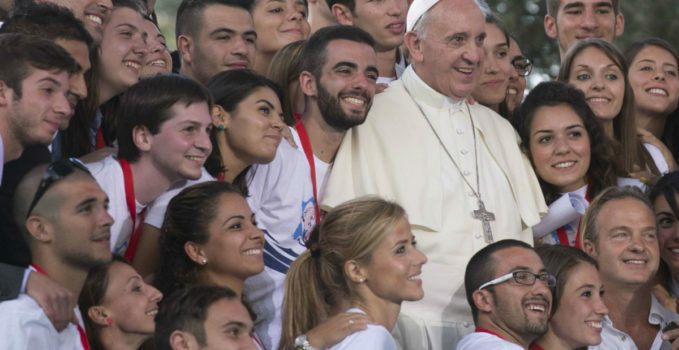 If anyone – including your parents, priests, or your teachers, tries to keep you quiet, remind them that the Church and the world need young people to be rejuvenated. And do not forget to have unbeatable allies at your side: the eternally young Christ, the young woman Mary, St. Gabriel and all the saints, who are the secret of the perennial youth of the Church.